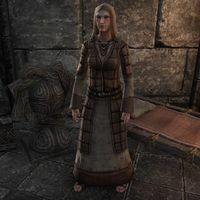 Abbess Iraldine is a Breton priestess found in the sanctuary of St. Pelin's Chapel, which is located in the city of Evermore. If asked, she will tell the story of St. Pelin, which also reveals a portion of Evermore's bloody past. She will also explain why Queen Arzhela is present in the chapel instead of the palace. "Blessings of St. Pelin be upon you. What brings you to the house of the Divines? Do you need aid or shelter?" "Ah yes, our namesake. He's a lesser-known saint, to be sure—but I suspect he'd like it that way. He had many virtues, and chief among them was humility." "St. Pelin was a simple beadle who tended to the soldiers of Bangkorai Garrison. This was long before the knights who bear his name took up residence. In those days, the Garrison held off far more than simple armies of men." "Vampires, wolves, and faceless shadows that made up a mighty army known as the "Gray Host." Such a blasphemous aggregation has not been seen since the First Era." "No one bothered to inquire. More than mere slaughter, I should think. Whatever their motives, when they crashed upon the walls of the Garrison, they slew hundreds—draining them of their blood and casting down their empty husks." How did the forces of the Garrison hold them off? "The vampires screamed their dark curses and slammed their claws and leathery wings into the gates of the fortress. St. Pelin knew that only blood might hold them at bay. So he cast himself into the throng and offered his own blood to the creatures." "Indeed. The vampires set upon him and began to devour him. But seeing his great courage, our lord Stendarr filled St. Pelin with an ocean of blood such that the vampires drank and drank but could not drain him dry." "So struck by his sacrifice were the soldiers of the Garrison, that they seized the moment and pushed a tottering battlement down upon the creatures gathered before the gate, destroying them." "And every word of it truth. May we all learn from his example—to give of ourselves what we can for our friends. We may well find that we have more to give than we thought possible." What is the queen doing here? "She's doing Mara's good work, my child. Queen Arzhela has a warm heart that finds no comfort in the palace. She came here shortly after the death of the king to aid us with the sick and the poor." But she inherited the throne. She's the ruler of Evermore. "Not all nobles are born to rule. Her royal highness finds her true calling in the simple joys of good work and charity. She would have made a fine priestess had her fate not been otherwise." This page was last modified on 17 September 2018, at 06:49.